What is the area between Ansem's study and computer room? The way it dwarfs SD&G is incredible. I haven't played this game in ages, and when I did I certainly wasn't paying attention to the story; I was able to find a cutscene where it's some Heartless generator, but it's so incredible - like the interior of the Death Star or something. I found an image of a chest down there; is there much to do down there? 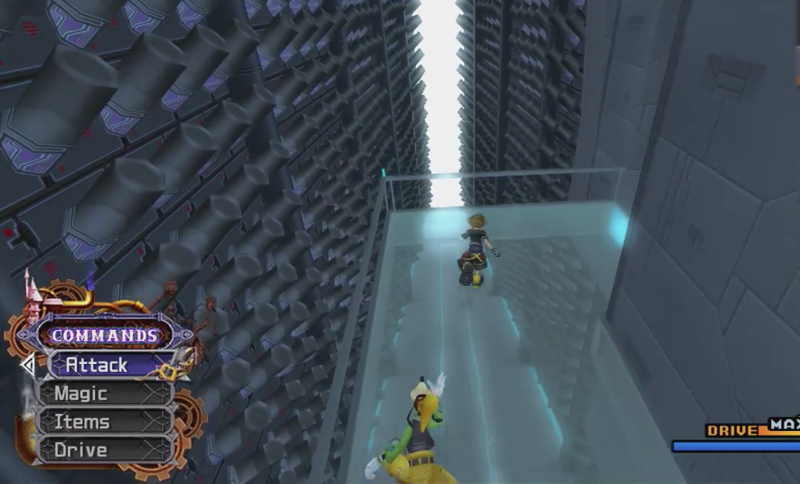 You can later get there, or at the very least part of it: it also has a secret entrance to Xehanort and the other apprentices' secret lab where they did all the forbidden experiments Ansem talked about in the Reports, but it's purely for cutscene purposes and you can't get there unelss you use some external means like a mod. So... there isn't much if not collecting a treasure chest and a puzzle piece if you're playing the Final Mix version. It's called the Heartless Manufactory and when the MCP in Space Paranoids tries to take over the world it actually gets to be used. This place is also mentioned in the reports of the first game.